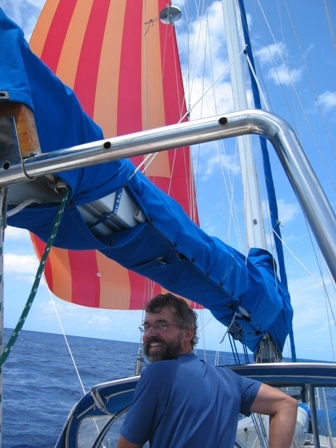 A happy Captain sailing fast with the asymmetric spinnaker! 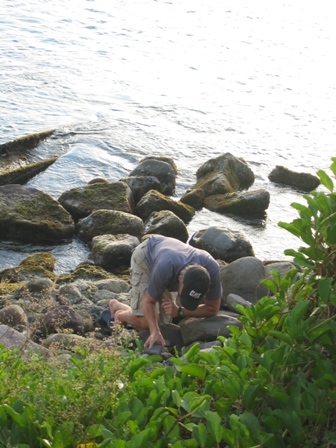 After patching the dingy and drying out the outboard motor, the next day we left Nevis for Sint Eustatius (Statia). The conditions were perfect, a true run, 10 knots of wind and minimal waves, we decided to try to fly the asymmetric spinnaker again. During our first Atlantic crossing we blew out the spinnaker but in England my sister Wendy and I were able to sew it back together and in Cascais, Portugal we had a patch placed on the clew. So up went the spinnaker and we were sailing along beautifully. It is quite the sensation when all of a sudden your speed picks up and you feel like you are surfing along. About 15 minutes later however, Marco noticed that the stitching appeared to be stretching on the tack. A few seconds later the whole tack side of the spinnaker blew out!! Well, it was fun while it lasted! I guess that it may be time to get a new spinnaker when we get home. 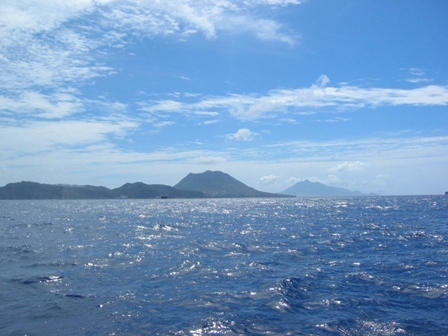 View of Statia (pronounced Stay-sha) as we are approaching from sea. 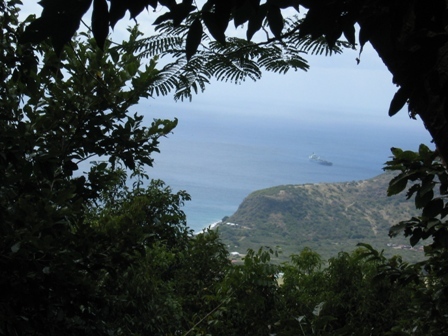 Statia is one of the lesser-known islands in the eastern Caribbean. It is apart of the Netherland Antilles and the eight-square mile territory is home to about 1,800 people. The currency used on the island is the Dutch Antilles Florin (Guilder) and the US$. 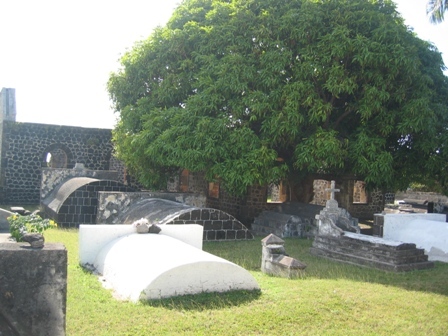 The capital and only village on Statia is Oranjestad. 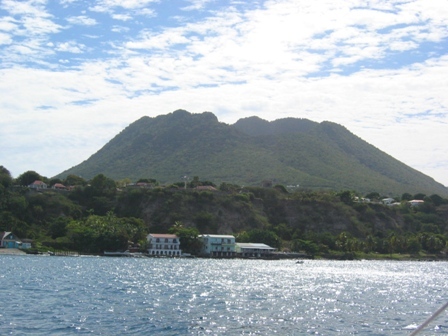 Statia is a Constituent part of the self-governing Netherlands Antilles Federation. The official language is Dutch but everyone spoke English. 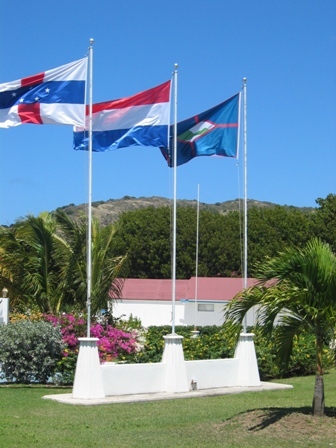 The flag on the left in the Dutch Antilles flag, the middle one is the Dutch flag and the far right one is the Statia flag. Marco was already feeling right at home!! 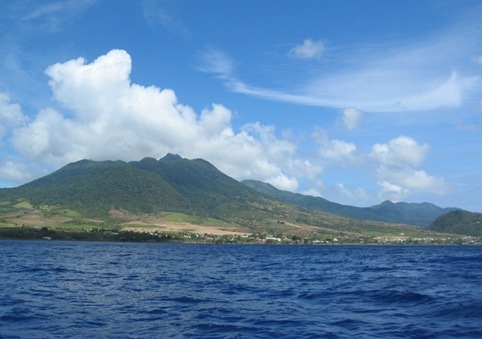 Statia was discovered by Columbus in 1493. From 1630 on, the English and the French took turns occupying the island until 1713, when the Treaty of Utrecht was signed and the Dutch got definitive possession of Statia. 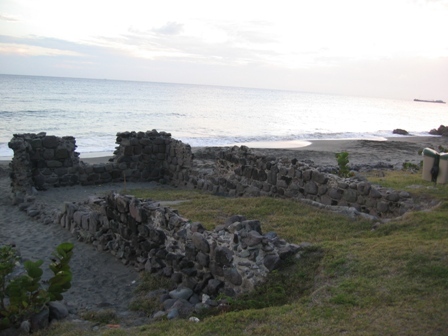 In the mid 1700's Statia became known as the trade capital in the Indies by making Statia a free port. During these years the European powers (England, Spain, France etc...) were fighting each other and the English were also trying to squelch the upstart of the colonies newly started in America. Here in Statia though, anyone could trade with anyone else, as long as Statian papers were attached. 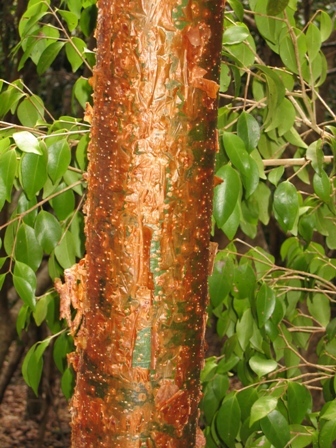 For instance, in 1770 Statia produced about 600,000 pounds of sugar, but exported over 20 million pounds. It was actually the practice of smuggling but made to look legal. It didn't take long for the 8000 Statians, now a mixed population of Dutch, English and Jewish merchants to become very rich. 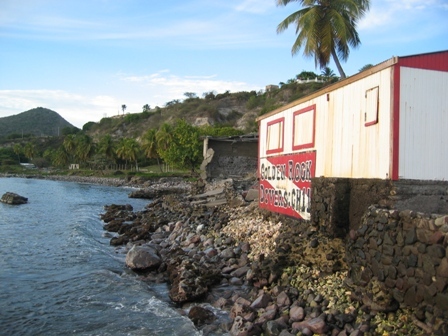 Statia became known as the "Golden Rock". Unfortunately the Statians wealth would not last for much longer. On November 16th, 1776, the Andrew Doria, an American sailing vessel pulled into port and saluted the people of Statia and their Dutch flag with a 13 gun salute. 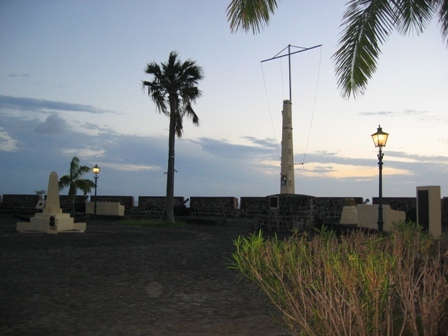 The governor of Statia, Johannes de Graaff, who was sympathetic to the cause of the American rebels, ordered the cannons of Fort Oranje to return the courtesy with an 11 gun salute. De Graaff's salute turned out to be the world's first official recognition of the sovereignty of the American colonies. Well, the British, once they got wind of this, were not very happy. I am sure it also had to do with an English ship recently being captured by the Americans and also that the Statians were selling arms to the Americans, but that salute was what started lead to a British invasion of Statia. 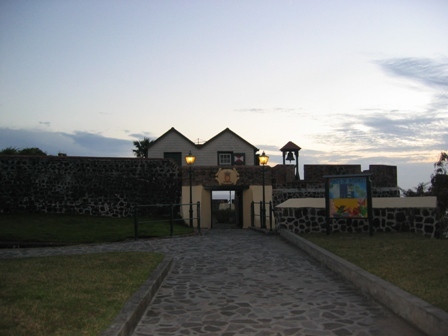 The entrance to Fort Oranje (pronounced "oh-rahn-ye") where the salute to the American Navy was fired from. 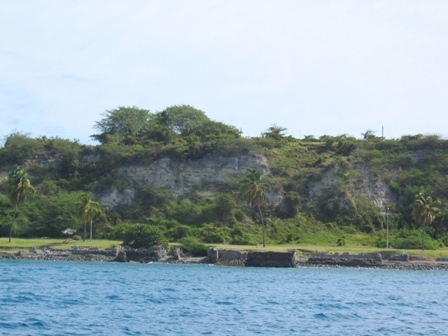 Fort Oranje Battery overlooking Gallows Bay. The English sent Admiral Rodney and his navy to Statia, and Statia soon surrendered. Admiral Rodney took all of their ships and places of business but was surprised to not find as much valuables and money as he expected. A few days later Admiral Rodney noticed that there seemed to be a recent increase in deaths on the island because the merchants seemed to be having an awful lot of funerals. He then ordered one of the funerals to be stopped and opened one of the coffins. Inside he found the valuables and cash he had expected to find in the ships and merchant buildings. Admiral Rodney then gathered up 100 Jewish merchants to deport them and when they were searched over 8000 pounds of sterling was found sewn in the hems of their clothes. Admiral Rodney confiscated all of these valuables also. The remains of the 18-century Jewish cemetery and synagogue, laying at the end of Princesweg Straat, where valuables were buried in the coffins by the local wealthy Jewish Merchants. Through all of this the Statians persevered and trading picked up again. Their good fortune would not continue, however. From 1795-1816 the French and British occupiers imposed huge taxes which subsequently killed Statia as a trading center. A huge emigration soon followed leaving Statia with only 1500 or so residents. Also the large seawall that was built, slowly sank and hurricanes pummeled the island completely destroying Lower Town where merchants once traded. Today all you can see of Statias prosperity is some crumbled old warehouses and merchant shops falling into the sea. Statians are still proud today of their historical gesture and on the 16th of November every year, they celebrate Statia-America Day, where cannons are fired from Fort Oranje and the islanders sing a hymn which includes the lines: "Statia's past you are admired/Though Rodney filled his bag/The first salute fired/To the American Flag." Then the flags of the 13 American colonies are hoisted above the fort to mark the occasion. The view from Dalliance of the remains of the lower town of Oranjestad. In the mid 1700's Lower Town stretched for two miles along the bay. 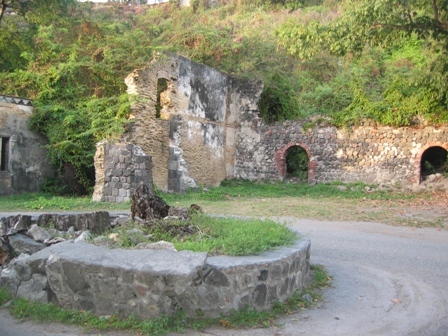 Warehouses, taverns, slave markets and merchant's stalls lined the road. Remains of Lower Town, Oranjestad's city center. Here you can see the grey-stone and yellow ballast brick walls of the old historic warehouses and buildings dating back to the 1600's. Dalliance at anchor off Lower Town. 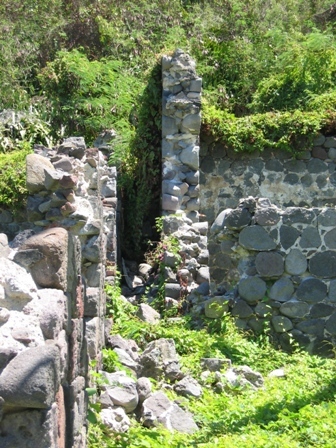 The slave trade was also very lucrative on Statia. 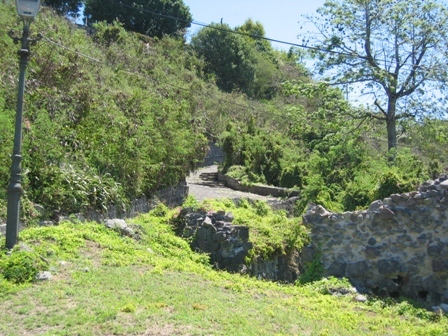 This is the Old Slave Road, built in the 18th century, that connects Lower Town to upper town Oranjestad. Today it is used as a short cut to town and is beautifully lit at night. Marco searching for blue slave beads. The slaves of Statia received blue colored beads as payment for their services or salaries. If a slave acquired enough of these blue beads he/she could buy their own freedom or even a spouse. These beads have been know to become uncovered over the years and is a pastime for the locals and visitors to search for blue beads. We were told that they are about one inch long and a deep blue in color. Having no luck finding blue beads Marco and I decided to head for the hills and climb to the top of Statia's dormant volcano, The Quill. At its highest point it is 600 meters, (1,968 ft.) The Quill is noted by geologists as having an almost perfect cone shape. 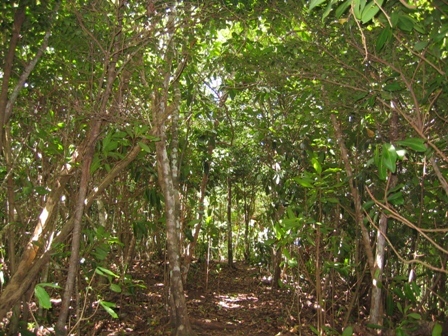 Inside the crater lies a tropical forest with towering mahogany trees, wild bananas, air plants and giant silk trees with 6-7 ft. buttress roots. A well maintained path to the edge of the volcano. 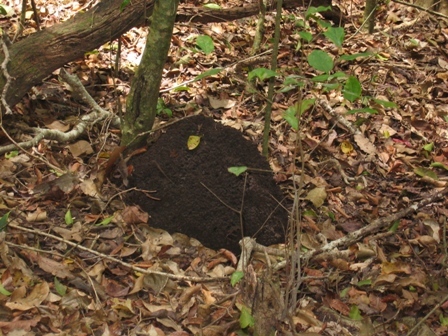 A Termite mound beside the path. 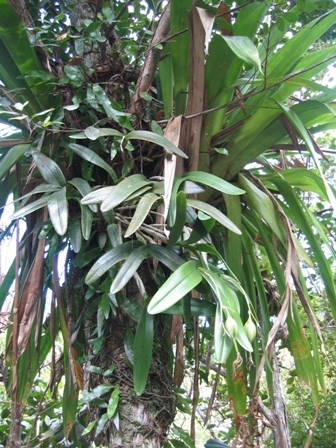 Some trees along the path and a wild orchid nestled in the crook of a tree. 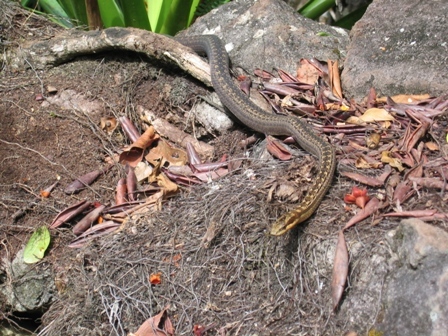 Red Belly Racer snakes, (Aslophis rufiventris) are only found on Statia and on the neighboring island of Saba. 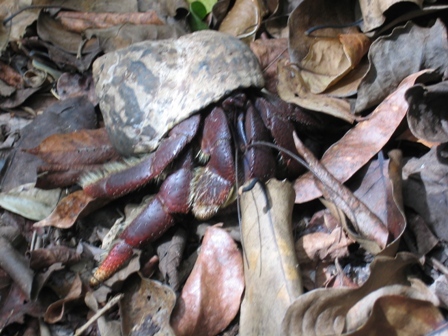 A huge (about 4 inches in diameter) purple clawed hermit crab. 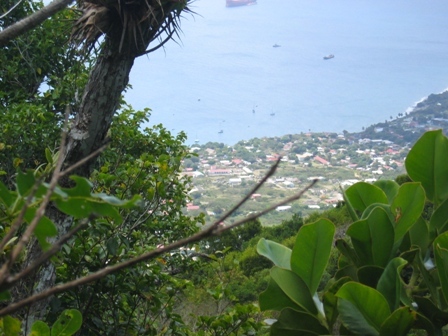 The view of the harbor from the edge of the dormant volcano, The Quill. 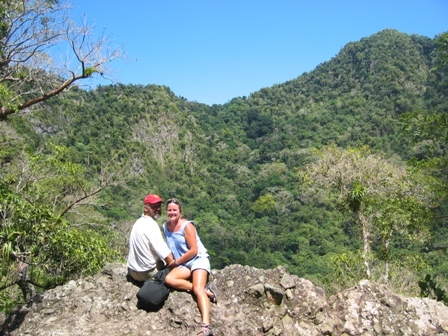 Marco and I enjoying the view on the edge of the volcano, looking into the crater. The next day after hiking Marco and I decided to go for a dive. Statia Marine Park is one of the top five sites in the Caribbean to dive, we definitely didn't want to miss that, especially now that we have the dive bug again. Diving on Triple Wreck, in about 60 feet of water, the ships wooded hulls long ago rotted away and what's left is piles of stone ballast where fish like to hide and coral grow. Along the dive Marco found a beautiful green glass platter just laying on the sand and we also saw a wonderful old anchor. A number of stems and bowls of old clay pipes dating back to the 1600's have also been found here. Fish and animal life that we saw were queen trigger fish, parrot fish, conchs and beautiful stingrays. In fact, Marco was floating about 3 feet above a sandy patch and when I looked over and noticed a huge stingray, approximately 6 ft. in diameter, laying directly under Marco. I motioned to Marco to take a look below him and when he saw the stingray right underneath him he did a fast back paddle until he was at a safer distance to observe it. We definitely have the diving bug now!!!! Marco and I also walked through the quaint town of Oranjestad where we had a our first Chinese meal since France and got to meet some of the locals. Statians have a way of making visitors feel very welcome. It was said that when an elderly resident was asked if many tourists visited the island, the elderly gentleman looked hurt. 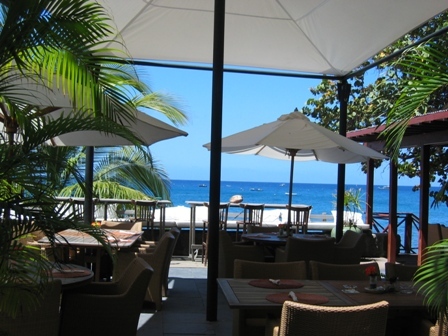 "My dear sir", he replied, "we don't have tourists on Statia, we have guests." That pretty much summed it up! 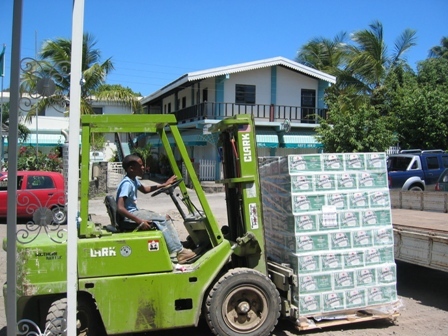 This was a boy no older than 8 loading up a recent shipment of the favorite "local" beverage. 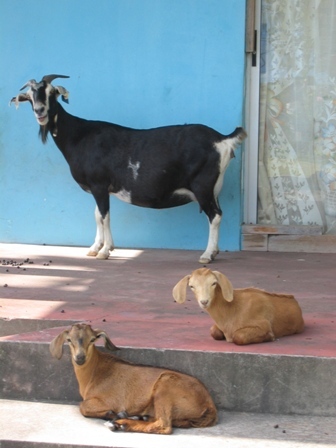 How often do you come home and are greeted by goats waiting at your front door? One of the hotel/restaurants in Lower Town housed in a refurbished warehouse. 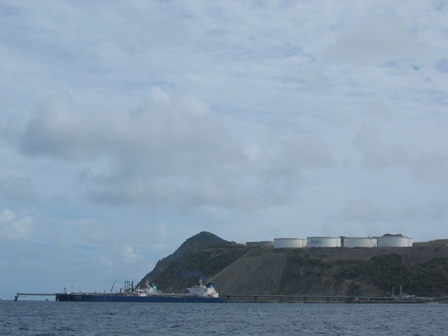 On the north/west end of the island of Statia is a oil depot where huge tankers come to refuel and to drop off fuel. It was fascinating watching these ships come in and out of the harbor. 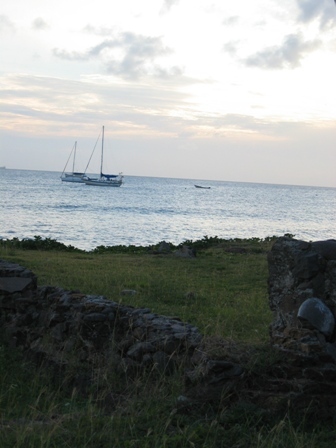 As we were leaving Statia for Saba we were able to see from front to back; Statia, St. Kitts and Nevis in the distance.